Sehr komfortable, ruhige, geräumige, helle Nichtraucherwohnung im wunderschönen Mesquite Country Club - Eine Wohnanlage mit einem 18-Loch-Golfplatz nebenan. Diese Wohnung ist in Phase 1 und Gesichter E Ramon. Dies ist eine End-Gerät sich im Erdgeschoss mit Blick auf den Pool & Spa aus dem Wohnzimmer. Draußen sitzen und entspannen Sie auf einer der beiden Terrassen. Die zweite Terrasse ist vor dem Schlafzimmer und beherbergt eine Waschküche mit voller Größe Waschmaschine und Trockner. Es gibt ein Queen-Size-Bett, 2 Nachttische und einen Ankleideraum sowie einen Spiegelschrank in voller Länge im Schlafzimmer mit viel Stauraum. Es gibt auch ein Queen-Size-Schlafsofa aus Leder mit Schaumstoffmatratze im Wohnzimmer und Federmatratze, die für zusätzlichen Komfort hinzugefügt werden kann. Es gibt auch ein Doppelbett elektrische Luftmatratze im Schlafzimmerschrank. Es gibt einen 32-Zoll-HDTV im Schlafzimmer. Die umgestaltete Küche ist voll ausgestattet mit allem, was Sie für Ihren Aufenthalt benötigen, mit modernen Geräten. Das Esszimmer hat einen Tisch und Platz 4. Es gibt einen 46-Zoll-HDTV im Wohnzimmer mit DVD- und Stereoanlage und einen Fernseher im Schlafzimmer. Nur zwei Meilen vom Main Strip entfernt. Sehr nahe am Flughafen und Einkaufsmöglichkeiten. Per the Palm Springs Vacation Rental Ordinence 1918, Bitte beachten Sie. ALTER: Sie müssen 25 Jahre alt sein, um diese Unterkunft zu buchen. Belegung: Die maximale Anzahl der Übernachtungsgäste beträgt 2 Erwachsene plus 2 Kinder unter 12 Jahren. NOISE: Achten Sie auf die Nachbarn und begrenzen Sie den Lärm auf respektvolle Pegel. Musik im Freien ist auf keiner Ebene und überall erlaubt. KEINE PARTEIEN ODER EREIGNISSE. Verstöße gegen die Stadtverordnung sind Geldstrafen in Höhe von 5000 USD und eine Geldstrafe in Höhe von 1000 USD sowie eine sofortige Räumung ohne Erstattung möglich. Danke für dein Verständnis und die Kooperation. The unit is well positioned, easy access from the airport, close to all amenities imaginable. It is clean, safe, contains all anyone could ask for, your home away from home quite literally. The pool is just off the patio, the BBQ is great for those who want to use it, we didn't but it was there. Though you're close to the airport there is no noise. The gardens and surrounding landscaping is extremely well maintained. Would highly recommend this unit to anyone going to Palm Springs or Palm Desert or Area. John, I am glad you had a great holiday at my condo and hope I can be of service to you again in the future..
One of the reviews that caught our eyes was the one that stated, "it looked just like the pictures". We found the same thing and were delighted with the convenience and design of the condo floor plan. Being more than fussy about cleanliness we were impressed with the state of the condo when we arrived and settled in very quickly. The kitchen was very well stocked with utensils, cutlery, pots and pans etc. Access to the pool is very convenient, just steps away from the rear patio. We thoroughly enjoyed the property and have already booked it for our holiday next winter. Thank you Judith!!! So glad you enjoyed your stay David and look forward to having you as a guest in December. Palm Springs one bedroom condo right beside the pool, great location, close to restaurants, pubs, shopping, short drive to downtown trendy shops and eating... the condo was well stocked with everything we needed, check the condo before you go shopping, lots of condiments are already there... we really enjoyed our one week stay over Christmas break... very comfortable! So glad you had a wonderful time Valerie. A pleasure to have you as a guest. Great communicator host easy to find location condo is set up very well. Randy, so glad you enjoyed my condo and Mesquite and had a wonderful holiday. 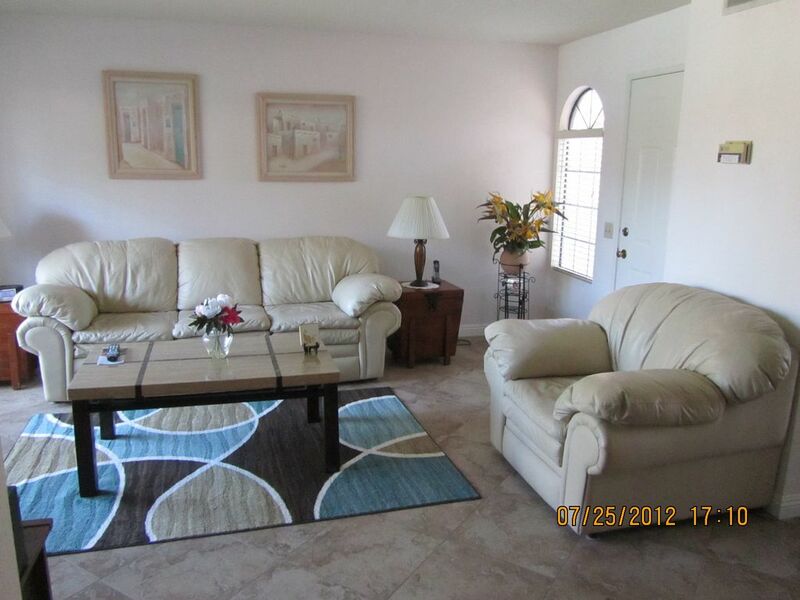 Beautiful condo, exactly like pictures! Daphne I am so glad you had a great time at my condo. Will be happy to help you again in the future. Was a pleasure to talk to you. So glad you enjoyed staying at my condo. Will be very happy to have you again if I can accommodate the dates. Will keep you informed if it becomes available in February or March. rates are subject to change until confirmed. 11.5% tax added to stays of 28 days or less. City ID#873 Credit card transaction fees will be deducted from the $300 deposit.